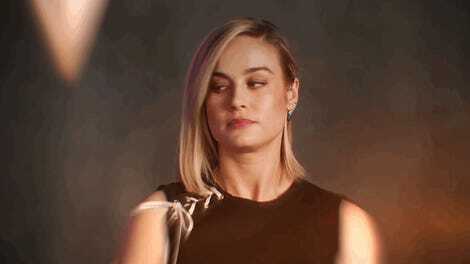 Brie Larson is Captain Marvel. After 10 years and 20 films, Marvel Studios finally—let me repeat, finally—has its first female superhero standalone film. And Carol Danvers is every bit as awesome as you had hoped. Co-directed by Anna Boden and Ryan Fleck, Captain Marvel opens with “Vers”—the name Carol Danvers (Brie Larson) is given by Yon-Rogg (Jude Law), her Kree mentor/leader. A trained soldier, Vers follows her crew—Yon-Rogg, Minn-Erva (Gemma Chan), Korath (Djimon Hounsou), Bron-Char (Rune Temte) and Att-Lass (Algenis Perez Soto)—into battle with the chameleon-like Skrulls, and ultimately ends up landing on Earth in the mid-1990s. Arriving on the strange planet raises even more questions, especially after meeting S.H.I.E.L.D. Agent Nick Fury (a digitally de-aged Samuel L. Jackson). 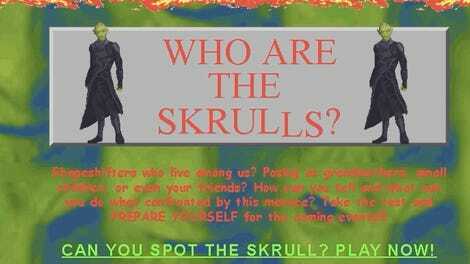 The Skrulls have also come to Earth and while searching for them Vers/Carol starts to realize there may be more to her mysterious life story. Let’s be clear: Brie Larson is the very definition of Captain Marvel. After watching the film, there is no doubt in my mind that there is anyone else that encompasses everything that Carol Danvers is and what she represents to comic book fans everywhere. Not only did Larson train vigorously to embody the physicality of the “most powerful hero in the MCU” (have you seen her pushing a jeep uphill!?) but she has an ease with herself that allows her to fully become the hero that women want to be and girls love to look up to. She is smart, witty, and yes, a badass. The “girl power” mantra is felt throughout the entire film, but this is also very much a buddy movie—in two parts. Carol’s friendships with Fury and Maria Rambeau (Lashana Lynch) are equally important but unique. This is a Fury we haven’t seen yet. Before Carol, he had never met someone with superpowers and questioned the existence of outside worlds. In Captain Marvel he gets to be more fun, and willing to go along for her journey with an open mind. Larson and Jackson are hilarious in what’s a bit of a mismatched duo. Jackson himself has been all smiles on the press tour and seems to enjoy seeing his own character’s origin story. In a way, this film is an origin story for him, Carol, and S.H.I.E.L.D. Agent Phil Coulson (Clark Gregg), who also makes a few brief appearances throughout the film. As a fan of the MCU, it’s fun to see the de-aging process as well as just how much each character has grown from the people we meet in Captain Marvel, to who we know they are in the upcoming Avengers: Endgame. And the fact that the film takes place in the ‘90s is a genius choice. The decade was a time where feminism was re-defining itself. It no longer reflected the bra-burning activism of our mothers; rather, ‘90s feminism was about defining strength in womanhood, whether it be physically (à la Sarah Connor in Terminator 2) or tossing out the idea of an “emotional” female (see: Daria) or simply, defining who you are (like Lelaina Pierce in Reality Bites). The multifaceted nature of womanhood is what sets Carol apart from all the heroes that came before her and it’s what makes her the strongest hero the MCU has ever seen. I was a teen in the ‘90s, so yes, I was totally hooked on all the nostalgic throwbacks like payphones, pagers, and Blockbuster Video (I used to work there!) locations that appear in the film. Not to mention the music that filled my angsty teenage days like Hole, Garbage, Nirvana, No Doubt, etc…oh, the ‘90s! My 11-year-old daughter reacted the way I expect most kids will react to these old school additions: She had a few questions about what a Blockbuster was, as well as what pagers did, why the internet was “sooooooo slow,” why computers were so big, and why we wore so much flannel. She found it amusing and odd, but she was too taken by the story to get overly distracted by those additions. In a way, it feels like a little wink that we find ourselves in the era that had no idea cat videos would be huge trend of the future, and yet, gives us one of the best cats on film—Goose (played by a team of cats, the lead being Reggie)! Goose is the real MVP and I need him in every MCU film from now on. To tell you why would be a big spoiler, so I won’t ruin it for you, but if you weren’t a cat fan before, you most definitely will be now. All that being said, Captain Marvel still doesn’t solve the origin story issue that has plagued every superhero film thus far, whether they be from the DCEU or Marvel. There are several lulls, especially in the first act. Some of them are caused by the jumping back and forth in time between when Carol was an Air Force pilot, and when she lands on Earth as part of the Kree. Unless you know the story from the comics, it can be a bit confusing until the pieces start to connect about mid-way through the film. 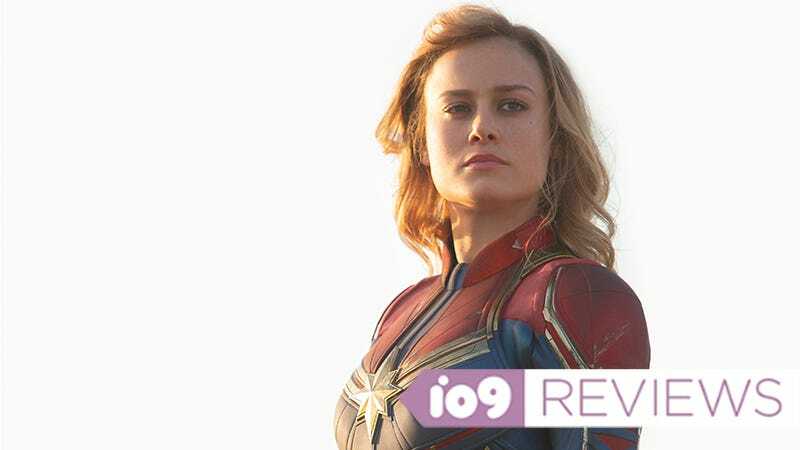 Plus, when you’re used to the most recent Marvel films, where we already know each character and can see them shine almost immediately, and Captain Marvel’s “big moment” takes far too long to arrive. But when it does...goosebumps galore. While Captain Marvel has powers that she has only begun to discover, her true strength is owning what has set her apart her whole life—just being a girl, because that is more than enough. Yolanda Machado is a Los Angeles based, Latinx freelance film/tv critic and journalist. She has been featured by the Los Angeles Times, CBC, AP and has bylines at TheWrap, Atom Tickets, Harper’s Bazaar, Marie Claire, Remezcla and many more.